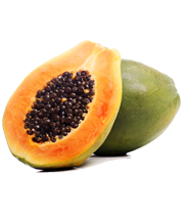 Papaya, also called papaw, or pawpaw, succulent fruit of a large plant (Carica papaya) of the family Caricaceae that is considered a tree, though its palmlike trunk, up to 8 m (26 feet) tall, is not as woody as the designation generally implies. The plant is crowned by deeply lobed leaves, sometimes 60 cm (2 feet) across, borne on hollow petioles 60 cm long. Normally, the species is dioecious, male and female flowers being produced on separate plants; but hermaphroditic forms are known, and numerous irregularities in the distribution of the sexes are common. Male flowers are borne in clusters on stalks 90 cm long; the flowers are funnel-shaped, about 2.5 mm (0.1 inch) long, and whitish, and the corolla is five-lobed, with 10 stamens in the throat. The female flowers are considerably larger, on very short stalks, and often solitary in the leaf axils; they have five fleshy petals that are united toward the base and a large cylindrical or globose superior ovary that is crowned by five fan-shaped sessile stigmas.